Compared to the shiny glass-and-steel towers nearby and the splendour of neighbouring Marunouchi Brick Square, the Shin-Tokyo Building between Yurakucho and Hibiya Park may feel a little worn, but it still houses quite a number of visit-worthy restaurants. One of these is an eatery driven by an admirable cause: Uoharu serves as the physical outpost of the Tsukiji Mottainai Project, an effort aimed at reducing food waste at the legendary fish market by making good use of the heaping piles of seafood and produce left unsold at the daily auctions or discarded due to cosmetic faults. 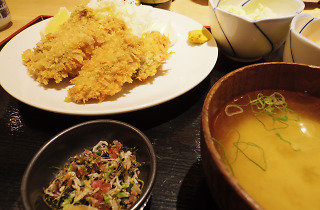 Opened in late 2014, it’s run by the Mugen group that also operates restaurants like the Nakame no Teppen izakaya chain and Nodoguroya Kakiemon at Nakameguro’s Koukashita, and has become a favourite of many local lunchers looking for a decent seafood teishoku or kaisendon bowl. At lunchtime, you’ll be prompted to order and pay in advance at the entrance – there’s usually a selection of five to six set meal options, all costing around ¥1,000 – while the evening hours see Uoharu turned into a no-frills izakaya with freely usable tables and counter seating around the open kitchen. Our daytime visit was hardly that memorable, with the fried oysters on our teishoku a little dry and the ¥1,200 price feeling a tad high (wasn’t this supposed to be leftover fare?). But evening brought redemption, as the plentiful nihonshu selection nicely complemented marine treats like shirako milt, mehikari (greeneyes) fish karaage and grilled tuna in miso (all around ¥500-¥700). 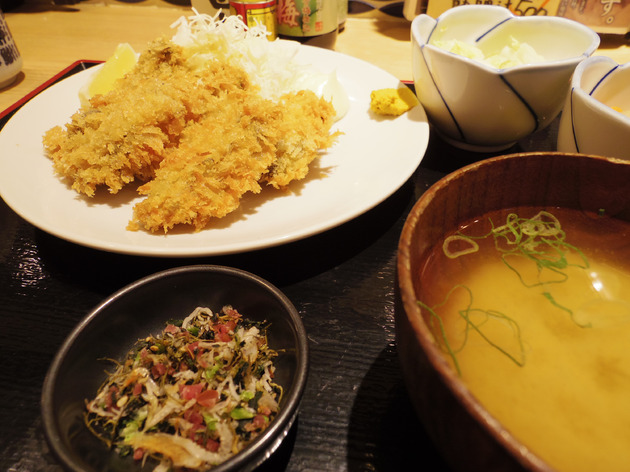 Although Uoharu doesn’t offer superb value considering the circumstances, it’s a perfectly decent seafood izakaya with a mission that we hope gets taken up by many more Tokyo restaurants from now on.